I would like to introduce you to Madison, Wisconsin's Rocky Horror floorshow cast "Decadence" and our theater. The Rocky Horror Picture Show plays at The Majestic Theatre, Madison's oldest theater, built in 1906. The Majestic Theatre began as a Vaudeville theater before it was converted to a movie house in the late 1920s. Now, along with Rocky Horror Saturdays at midnight, it plays mostly art and foreign films. The Rocky Horror Picture Show started playing at The Majestic Theatre in May of 1978. 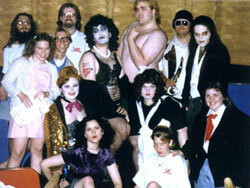 A small floorshow group formed in 1984 when a few Rocky Horror regulars dressed up in costume and acted out their favorite scenes. "Decadence" was formed in January of 1987 when the original floorshow cast (then "The Dark Refrain") was restructured and renamed. Many improvements came with this change: the cast began rehearsals, costumes were perfected, many props were obtained, and larger props were built including; the tank, coffin clock, and the creation wheel which lowers using a pulley system. Two people still remain from the days of "The Dark Refrain". 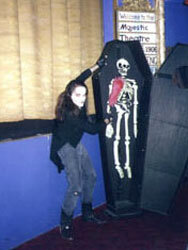 Myself, I have been playing Janet since November of 1986 and I am one of the cast directors. My husband, he has been playing Frank-N-Furter since June of 1986 and is also a cast director and the local Rocky Horror fan club representative. We are another Rocky Horror couple. We met at the show before I joined the cast and we were married in September of 1989. The cast has two other members who have made a long term commitment: one started in February 1987 as Rocky and now plays Riff Raff, the other began as Eddie in June 1987, then played Riff Raff and now plays Rocky. Like most Rocky Horror casts, Decadence has two special occasions per year, Anniversary and Halloween. These nights will include activities like: a costume contest, Rocky Horror trivia games, a special virgin sacrifice, and a special preshow by the cast. Some other things we have done as a cast have included two trips to Minneapolis, Minnesota to perform at the Uptown Theatre (once in November 1989 and once in July 1990) and we put on a Rocky Horror convention in June of 1995. So, if you find yourself in the Madison area look us up at The Majestic Theatre. The Rocky Horror Picture Show shows every Saturday at midnight and "Decadence" performs every first, third and fifth Saturday nights of the month. Don't forget to come down and say "Hi" to the cast.